Starting August 2010, the INDEVCO Ajaltoun headquarters will officially be going green. Phoenix Energy in Safra, Lebanon, has successfully designed and put into motion the installation of four 25 kilo-watt biomass boilers at the first building of INDEVCO regional headquarters in Ajaltoun, Lebanon. The objective of this initiative is to reduce harmful emissions by replacing existing diesel boilers in the first and fourth floors, which are calculated to consume approximately 3200 liters and 3000 liters of diesel/year respectively. The annual diesel consumption allocated to space heating for the entire 6-floor building is around 16,000 liters. The expected Return On Investment (ROI) for this project is approximately 5.7 years with 30% annual savings on fuel cost which is roughly $3550/year. Phoenix Energy partnered with D’Alessandro Termomeccanica of Miglianico, Italy, to become the exclusive agent of the CSI model biomass boilers and all other biomass boilers in the Middle East North Africa (MENA) region. 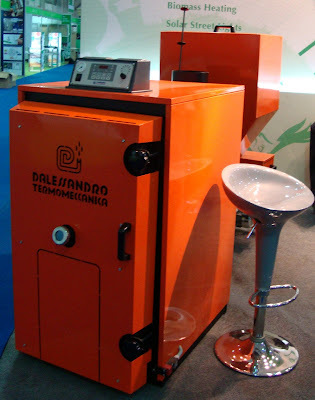 The biomass boilers are developed and manufactured in Italy and operate at 92% efficiency. Phoenix Energy’s engineers turned to readily-available olive husks from local olive oil mills in Lebanon to fuel these biomass boilers, finding an eco-friendly solution as replacement to the diesel boilers used for space heating. Phoenix Energy is a sister company to Phoenix Machinery and a member company of INDEVCO Group, the 'Local Multinatinonal of the Middle East'.